Wedding season is here! 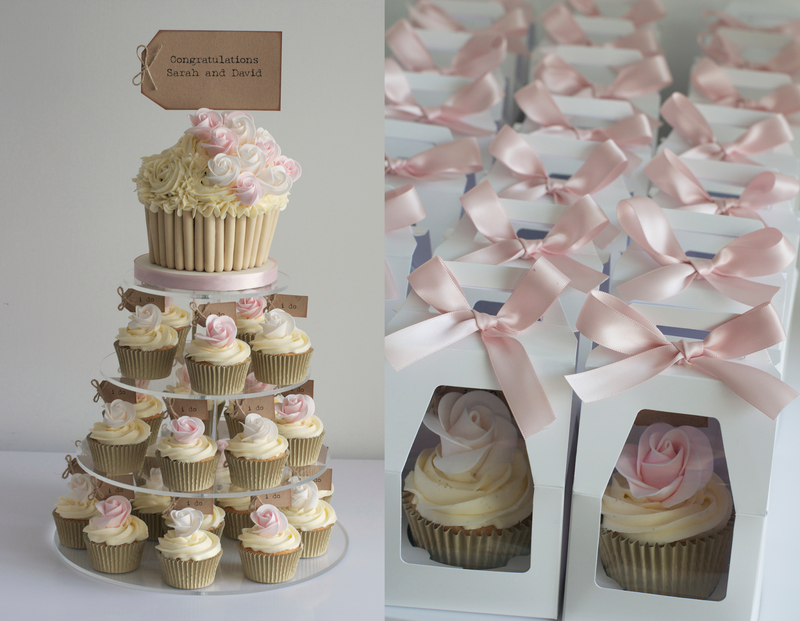 Lots of lovely wedding cakes have gone out in the past couple of weeks. The first was for Sally and Scott who got married at the beautiful Inn on the Lake, Ullswater. 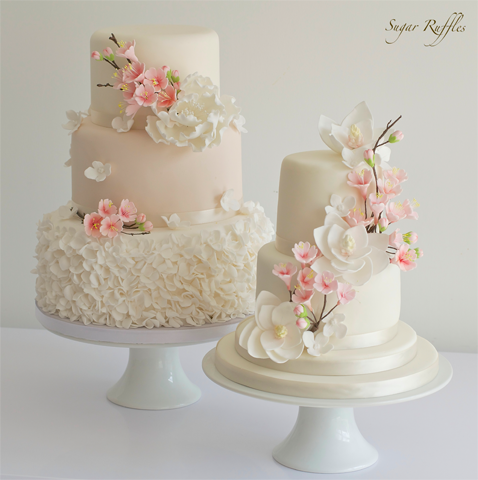 This 3-tier wedding cake featured delicate ruffles on the bottom tier with clusters of pink and white sugar roses. The flavours were bottom tier- vanilla bean, middle tier- dark chocolate, top tier- zesty lemon. I received a lovely thanks you card from the happy couple with some very kind words "Thank you so much for our amazing wedding cake... it was totally perfect and got so many compliments. You are very talented- and it was delicious Thank you Sally and Scott Maynard. Next up was this 2-tier wedding cake with cascading pink sugar roses for an intimate wedding at the stunning Linthwaite House Hotel. The flavours were: bottom tier- summer berries and top tier- zesty lemon. The Bride, Sarah sent me a thank you message on the day of the wedding! This was really lovely of her and I am so happy that she was pleased with her cake. Congratulations Sarah and Richard! 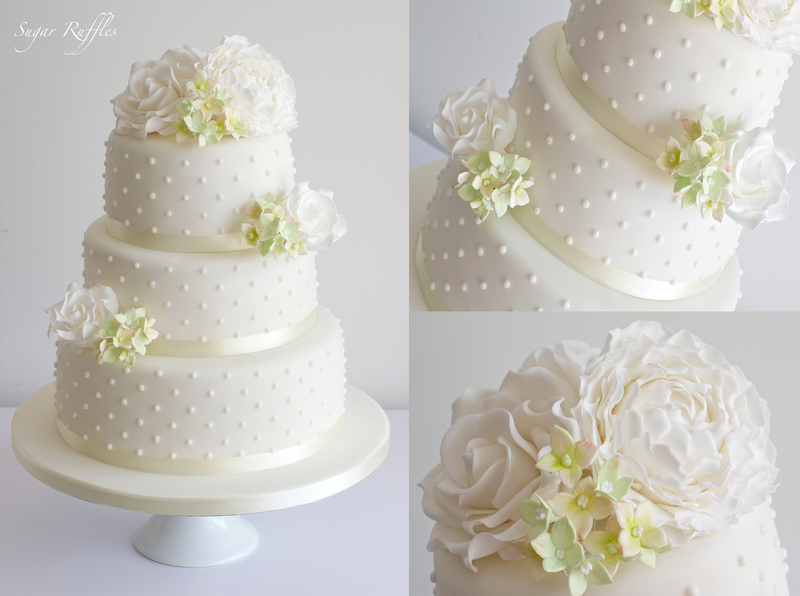 This 3-tier wedding cake featured piped swiss dots, white sugar roses and peonies and green hydrangea flowers. We set the cake up on top of a ring of beautiful flowers provided by The Flower Shop, Ambleside at the Lake House at Gilpin Lodge. The bottom two tiers of the cake were lemon and elderflower and the top tier was a gluten free carrot cake. Congratulations to Rachel and Ben! This 2-tier wedding cake was covered in beautiful edible lace and topped with sugar flowers including pacific blue roses and pale blue hydrangea flowers. The cake and favours were delivered to the Daffodil Hotel & Spa for the wedding of Christine and Leon. Congratulations to the happy couple! 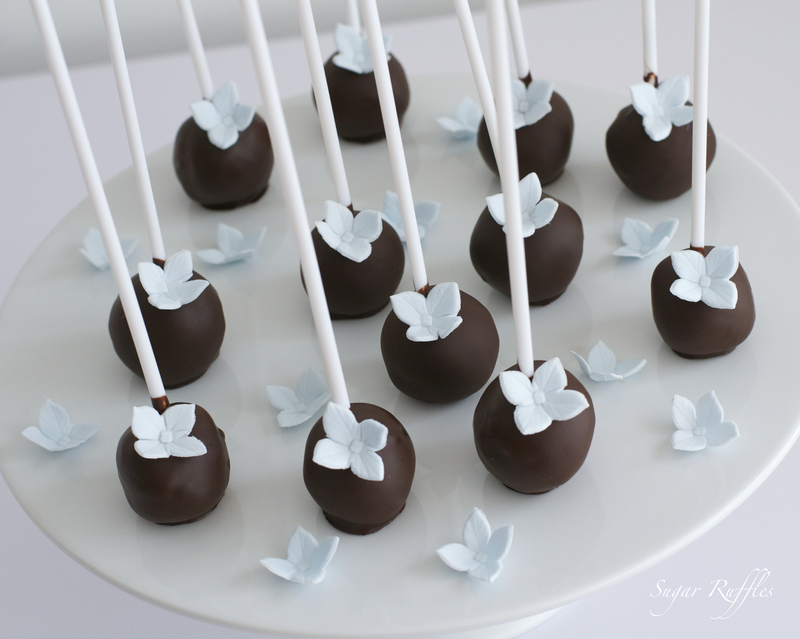 Each guest was also treated to a dark chocolate cake pop decorated with miniature pacific blue roses and pale blue hydrangea flowers. 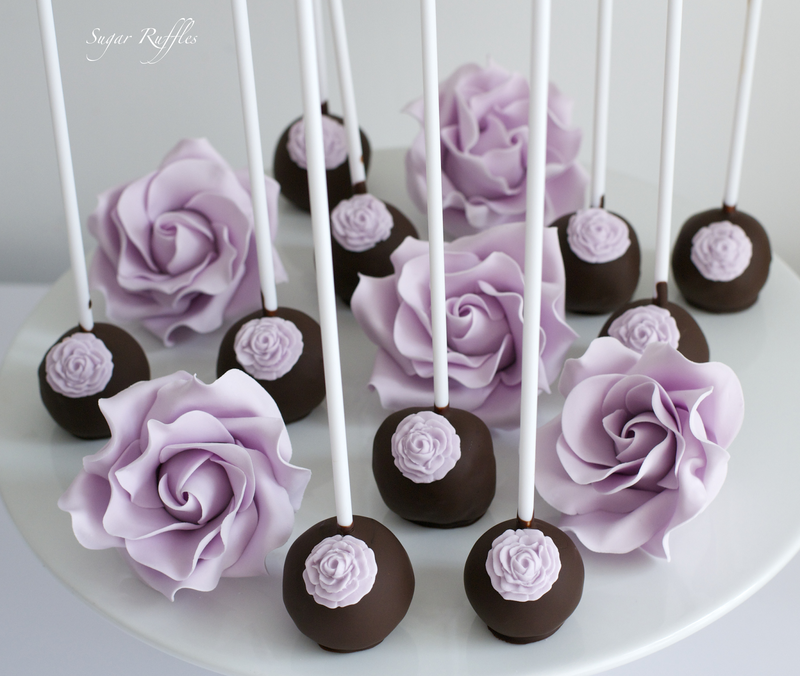 Each cake pop was individually wrapped and tied with ribbon. This 3-tier ruffle wedding cake with pale coral and mint green dahlia flowers was created for bride, Lisa who planned her wedding all the way from Australia! The cake was set up at Lodore Falls Hotel in a room that was filled with coral and mint green pompoms which looked lovely and complimented the cake perfectly! The flavours of the cake were: Top tier-lemon, middle tier- white chocolate and passionfruit and bottom tier-chocolate orange truffle. A cupcake tower featuring a large cupcake with cascading sugar roses and cupcakes topped with pink and white sugar roses and 'i do' picks was created for Sarah and Davids wedding at Miller Howe Hotel. Each guest was treated to a vanilla bean cupcake in an individual box tied with ribbon. 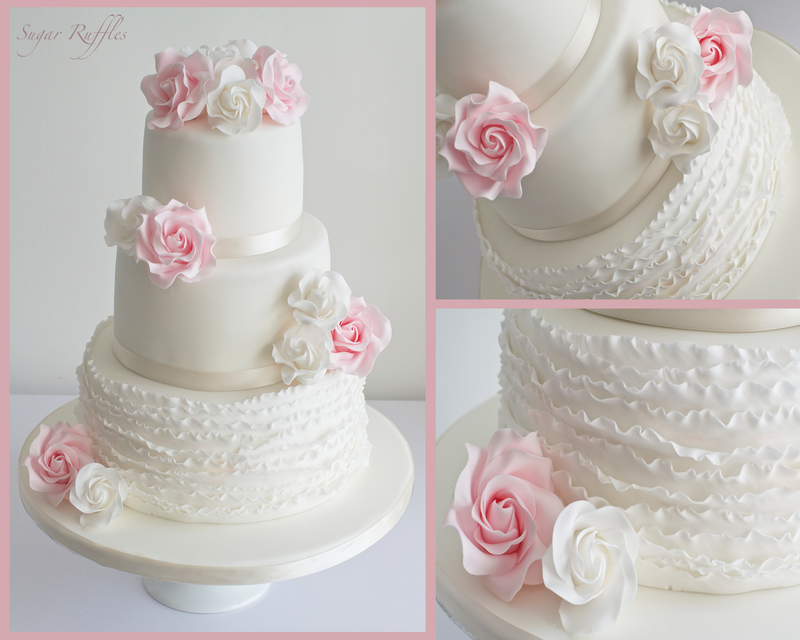 This 2-tier wedding cake was created for an intimate wedding at Holbeck Ghyll Country house hotel. The bride and groom wanted to incorporate cherry blossom into the cake as a reminder of the beautiful cherry blossom they had seen on a trip to Japan together. We also incorporated some magnolia flowers into the design. I received a lovely message from the bride "Thank you so much, we were over the moon with it, so happy...very talented x" and the brides Mum "Jennifer's cake was beautiful. 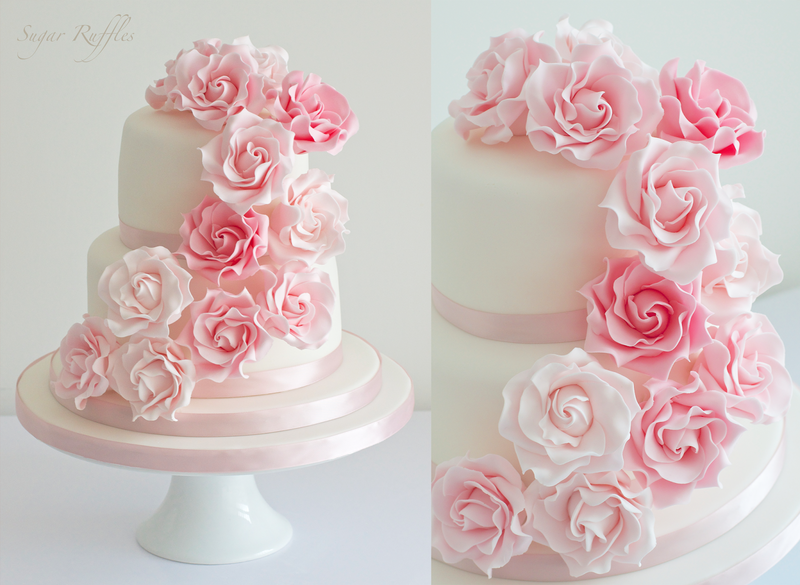 the flowers were so delicate and the cake tasted lovely". 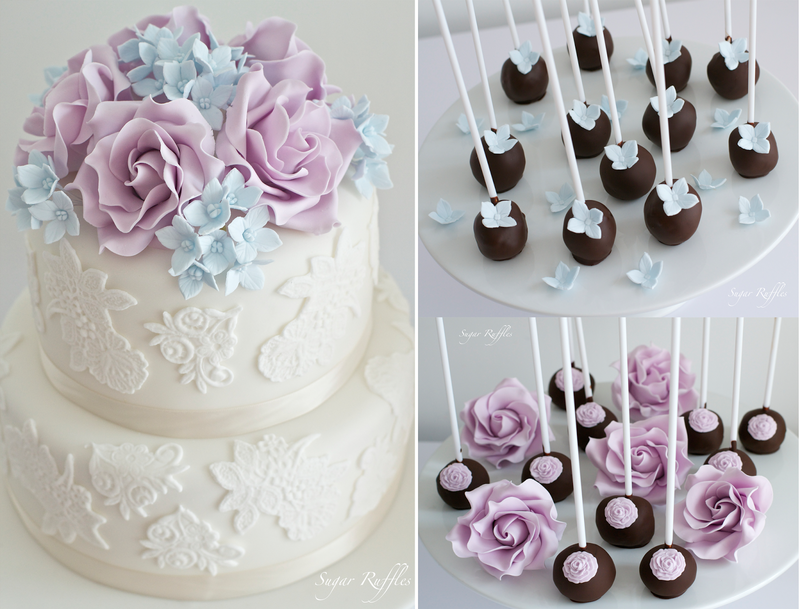 All of these are really beautiful wedding cakes with great taste surely. 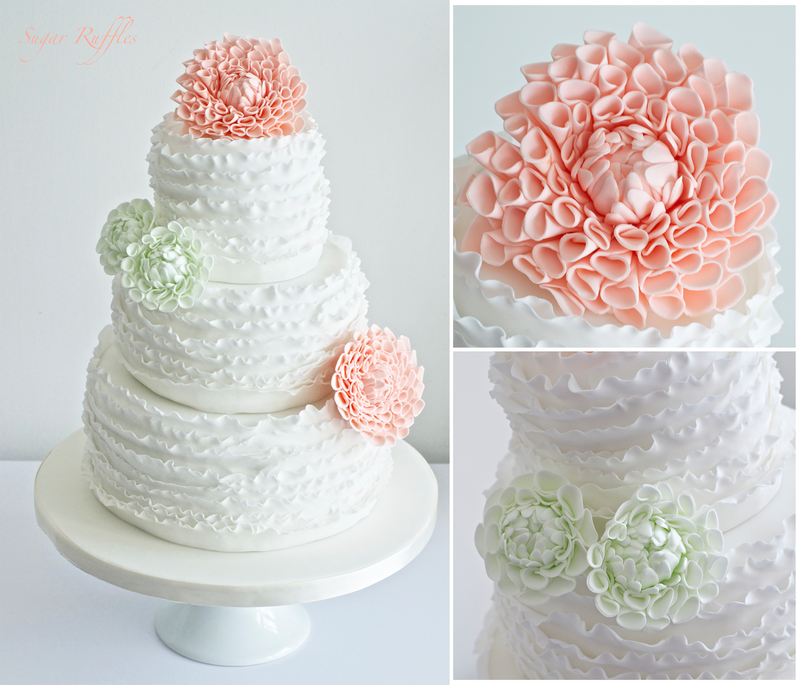 I loved the design work in ruffle wedding cake with pale coral and mint green dahlia flowers. You did a great job and i am really impressed by this work.